Lanesville Arts & Craft Home Auction — Harritt Group, Inc.
10% Non-refundable down payment due day of auction, balance due in 40 days. Taxes prorated to day of closing. Possession at closing. Selling as is with no contingencies, all inspections welcomed prior to auction. Craftsman style two bedroom bungalow with original charm and character located downtown in historic Lanesville on St. Hwy. 62 known as the Ohio River Scenic Byway. Easy access to I-64 and centrally located 9 miles East of Corydon and 13 Miles West of New Albany. Perfect for homeowner or investor! 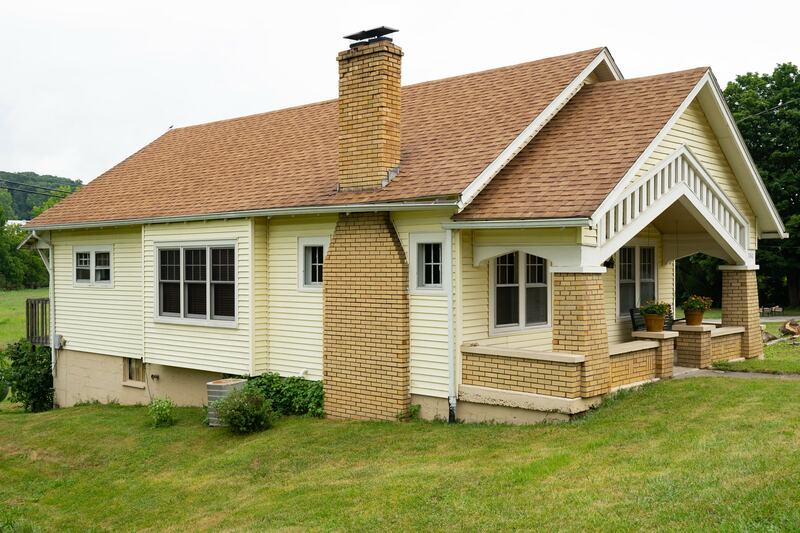 Circa 1930 craftsman style 2 bedroom – 1 bath bungalow with 960 square feet on the first floor, 960 square feet in an unfinished basement with one-car garage and brick covered porch on 50’ x 165’ lot in the quaint town of Lanesville just minutes to expressway. This home still retains its original craftsmanship with wood marquetry floors, mission style fireplace with built-in bookcases, 9’ ceilings, triple window bench in the formal dining room, equipped kitchen, central air, LP gas heat, city sewers, and water. Located just minutes from schools and 2 miles from I-64 Lanesville Exit in Harrison County. I-64 to Lanesville Exit #113. South 2 miles on Crandall Lanesville Road to left on Main Street (Hwy. 62). 800 ft. to auction on left. Centrally located – 9 miles East of Corydon and 13 miles West of New Albany.